A world first in fruit trees and only available from YouGarden! Unique ripening pattern - pick little and often over an 8 week period through autumn. Delicious juicy apples with a lovely sweet taste glowing gold when ripe. Great as a small specimen tree or in large containers (more than 45cm or 18inch diameter). Exclusive rights for this Amazing new Apple tree. 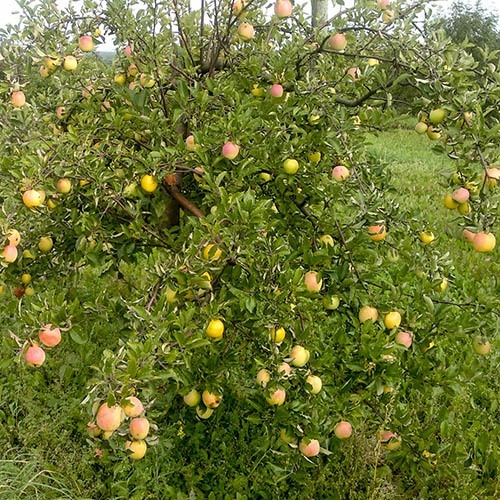 Apple 'Sweet Summer' is a world first in apple trees - its delicious sweet fruits do not ripen all at once, which emans you have to pick them all togetehr and store them or eat them all. No, 'Sweet Summer' ripens in Autumn over a period of 6-8 weeks, meaning you have a 2 Month continual supply of ripe fruit you can leave on the tree and pick fresh every week. This long ripening trait is of course not at all desirable for commercial orchards, where they want to pick all the fruit on one day, so this seedling was nearly consigned to the skips of history! Luckily, the breeder realised this could be of real benefit to gardeners, so he lept it, and relased it just to us this year. It is a self-fertile tree, on P22 rootstock, which is even more dwarfing than M9. It is a seedling from 'Golden Delicious', the fruit develops green, and then turns blush and eventually to yellow when they are ripe to pick. It is very resistant to heat anf frosts, so survives all extremes really well. Great as a small specimen tree or in lareb contaoners (more than 45cm or 18' diameter).